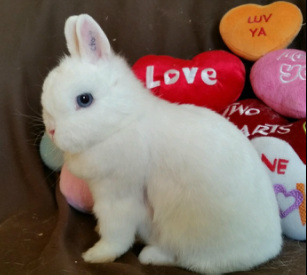 We no longer raise and breed Netherland Dwarfs, mainly because the dispositions of our adults were not as reliably sweet as our Holland Lops and Mini Rex, and we never wanted to have a child (or adult) have a negative experience with our rabbits. They were also incredibly difficult to breed. Netherland Dwarfs are one of the smallest breeds of rabbits and weigh 2-3 pounds when full grown. 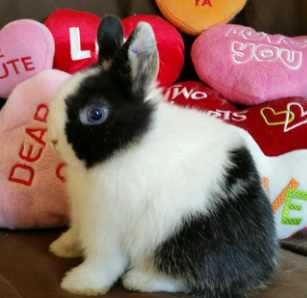 We chose them because one of my sons' first pets was a precious Netherland Dwarf. She had a great temperament, and they spent many hours playing with her and teaching her tricks. We have now decided to only focus on high quality rare & beautiful blue eyed white and Vienna carriers. ﻿This breed of rabbit weighs under 3 pounds, making it a wonderful companion to those who don’t have the space for larger pets. The petite body of the Netherland Dwarf has shoulders that are the same width as the hindquarters with a rounded and high-set head. The ears should stand erect and ideally should be no longer than 2 inches. The Netherland Dwarf rabbit is the smallest of all rabbit breeds but are very similar to the Polish Dwarf breed (with the exception of the shorter ears). They have a delightful personality, however, some may get a little offish once they reach puberty. During this time they can become a little more difficult to handle. It may be best to have them spayed or neutered if they are not going to be bred. As they get older they seem to settle down and continue to be wonderful pets. Listed below are the Netherland Dwarfs we used to have as our breeding stock.